Since developing the world’s first jet towel in 1993, we have continued to improve technologies and services focusing on ease of use for our customers . 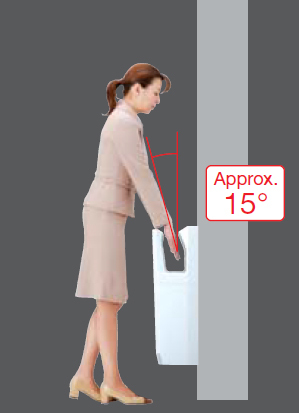 The high-speed Jet Towel hand dryer uses jet streams of air to dry hands, eliminating the paper waste associated with the use of paper towels, and thus relieving you of the trouble of waste disposal as well. The preservation of forest resources will also contribute to enhancing your corporate image. The monthly expense is reduced to fraction of the cost in comparison to paper towels or rolled-cloth towels. The higher the use, the greater the savings. Appealing to building management companies too! The only maintenance required is clean the air filter and removing water from the drain tank. 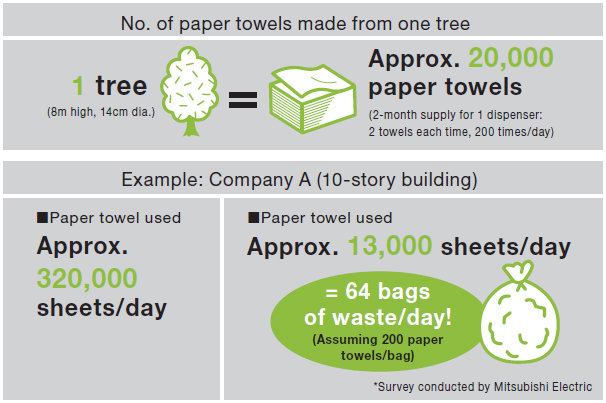 Save time by eliminating the daily replenishment of paper towels, disposal of paper towels, disposal of paper waste and replacing rolled-cloth towels. Evaluated highly for its sanitary characteristics, the Jet Towel is a popular among facilities and shops alike. 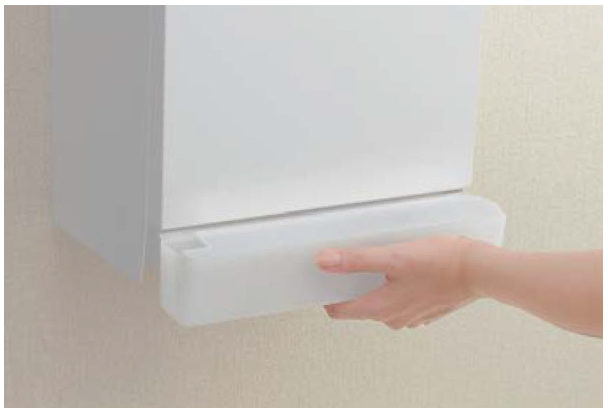 In addition to its ability to dry hands completely in a matter of seconds and offer a clean sanitary environment for customers, maintenance and upkeep costs are minimized for maximum cost efficiency. The results, enhanced customer service. Easy hand access from both sides. For smooth and reliable operation, the dryer is equipped with upper and lower sensors. 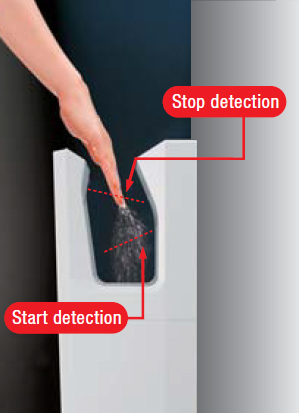 Once hands are fully inside, lower sensor detection starts the air flow, and when hands are removed completely, upper sensor detection stops the dryer, preventing water drops from blowing back up. The new slim type is equipped with a “child sensor* further enhancing operation ease. Easy to use natural posture. Development included studying a hand insertion angle comfortable and easy to use for a majority of people. As the result, the front panel is gently slanted outward, creating a ergonomic hand insertion angle for approximately 15 ° that allow users to stand comfortably and naturally when inserting their hands into the trough. 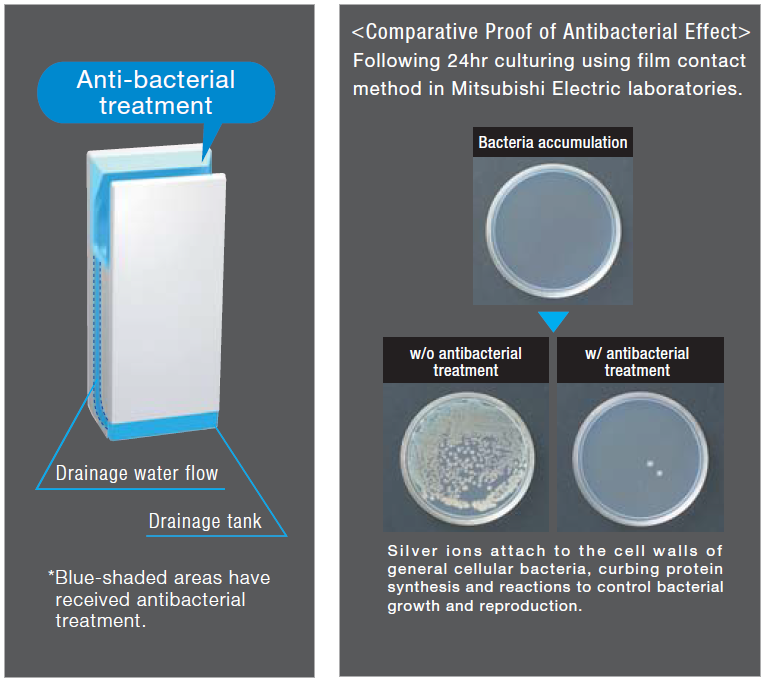 All parts susceptible to coming in contact with water, such as hand-drying section, drain tank and water drainage duct (drain hose), are subjected to antibacterial treatment to ensure highly sanitary conditions. Independent air ducts ensure airflow is always fresh. 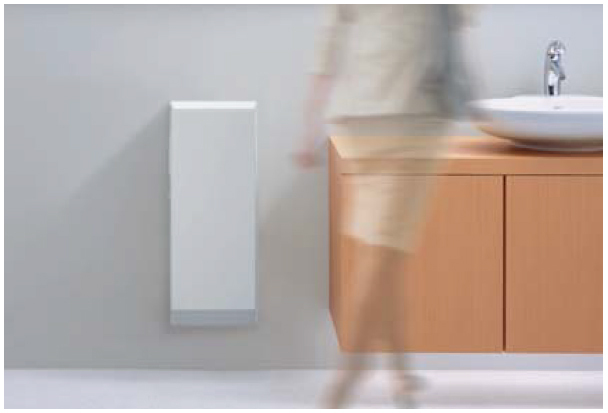 In addition to an extremely hygienic touch-free design, emphasis has also been placed on ensuring the flow of fresh-air. 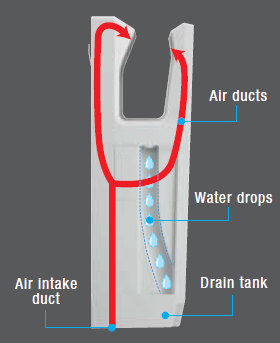 The air-intake port and airflow route are isolated from the water drainage duct in Mitsubishi Electric products. Inserting the hands triggers a jet-stream of fresh air without using any air in the vicinity of the hands. Can be wiped clean with alcohol. An alcohol-resistant resin is used, enabling alcohol-based products to be used to be used for cleaning the hand-drying section, drain thank and water drainage duct where sanitary conditions are a matter of concern. The open-side design, which allows easy hand access from either side, ensures quick and thorough cleaning of the hand-drying section as well. There is a choice of two airflow speeds: “high” for prioritized drying and “standard” for low-noise operation. The heater can be switched on or off. The setting switches are located inside the main unit, and can only be set at the time of installation. Stable operation for long service life. The motor is a key part of the Jet Towel. Accordingly, Mitsubishi Electric has developed a durable, high-quality brushless DC motor (Slim Series) designed for use 400 times a day for seven years. Eliminating problems related to the wear-and-tear on motor brushes ensures truly efficient power and stable operation for extended periods of time. 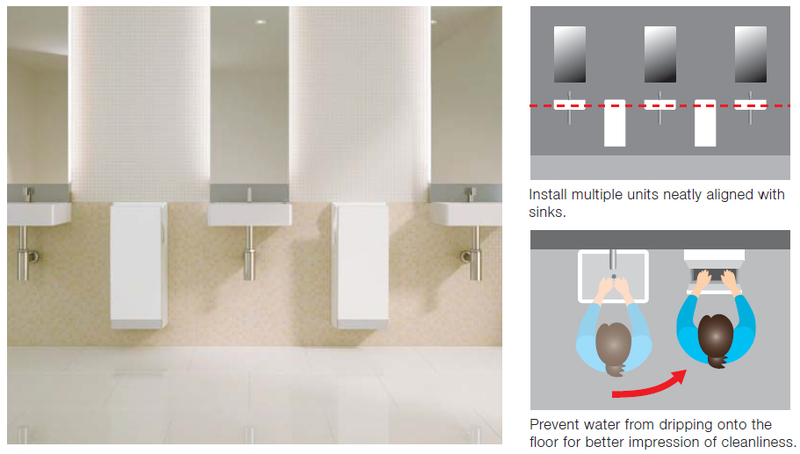 Designed for Installation between Sinks Can be aligned with the top of sink basins. The ergonomic rectangular design matches well with most sink styles. Overall unit size was taken into consideration as well, ensuring that the top of the unit can be neatly aligned with the top of the sink basin. To ease congestion and prevent water spillage, the installation of multiple units is recommended for places frequented by many people such as movie theatres and amusement facilities where many may people use dryers at the same time. Choose from a Variety of Colours Units blend easily into any décor. In addition to highly popular White, a variety of new colors are now available. Two-toned Dark Gray and Silver, having a dark-gray body and silver front panel; a chic Dark Gray that is ideal for tranquil restaurant atmospheres and the like; and stylish Silver for upper-class hotels and similar venues. 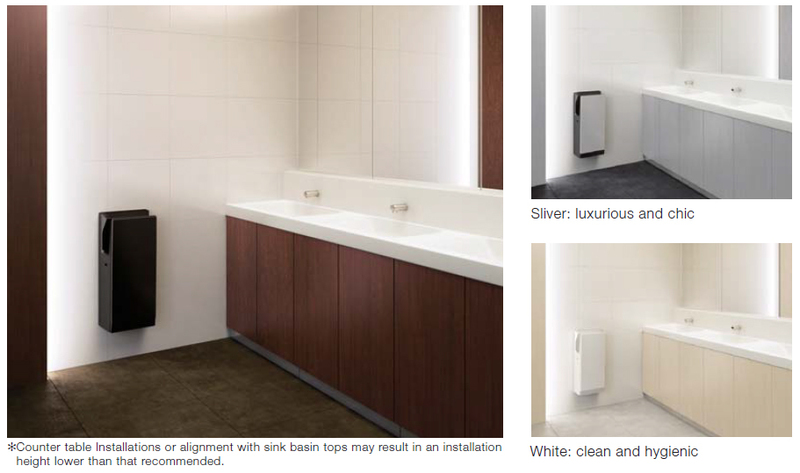 The extended color line-up offers greater flexibility in color coordination and installation applications.